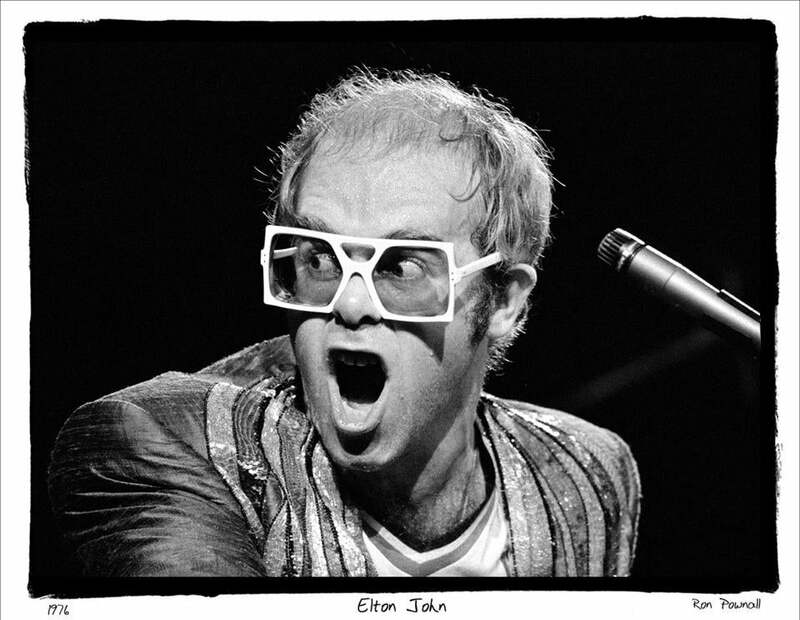 Ron Pownall’s shot of Elton John during a 1976 concert at New York’s Madison Square Garden is among 49 photographs in the show. Synesthesia is a neurological term that describes when one sense impression produces a related impression involving a different sense. Hearing a particular sound, for example, one might see a particular color. Synesthesia, of a sort, is what “Music to Our Ears” has to offer. It runs through Sept. 13 at Panopticon Gallery. Looking at the show’s 49 photographs, three posters, and six guitars — yes, guitars, and wonderfully sculptural they are — a viewer can’t help but hear an awful lot of music. The guitars were made by Panopticon owner Jason Landry and his uncle Joe Landry. The posters give a sense of the show’s musical tastes. 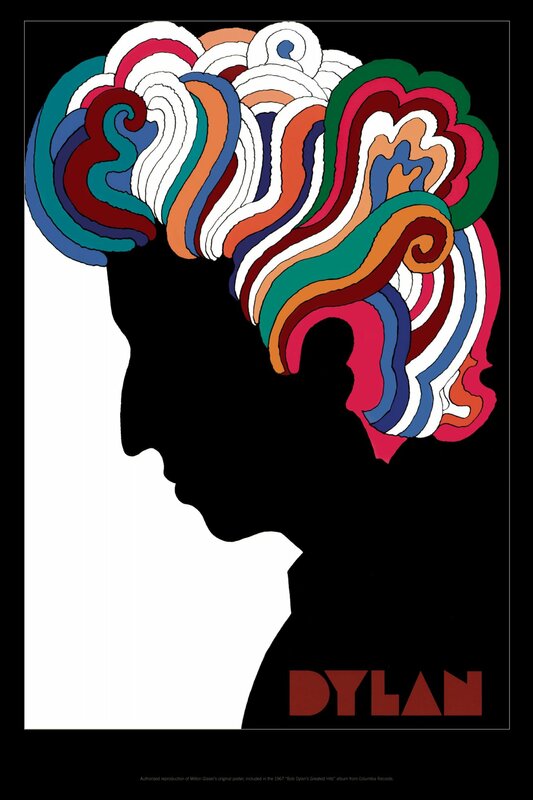 Milton Glaser’s famous profile view of Bob Dylan turns the singer’s tresses psychedelic. 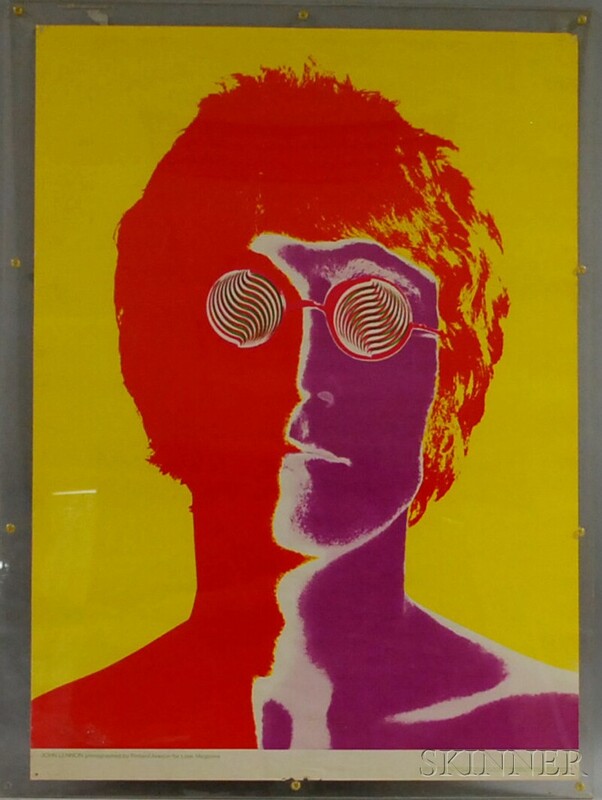 Richard Avedon’s even more psychedelic portrait of John Lennon graced the cover of Look magazine. 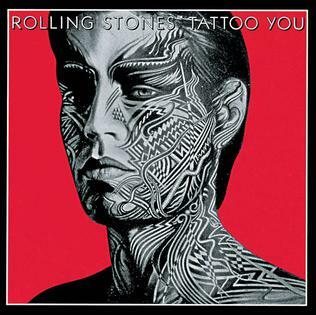 The cover for the Rolling Stones’s “Tattoo You” album offers Christian Piper’s epidermal-canvas illustration. So we’re talking classic-rock heaven. There are three other views of Lennon (Roger Farrington photos from the “Double Fantasy” sessions). Rowland Scherman has two Dylan photographs, as well as the Beatles onstage at their first US concert, Janis Joplin, and Stephen Stills (at Judy Collins’s piano, no less). Wolf and Geils aren’t the only local heroes. Liz Linder offers some hereabouts rock history with pictures of Letters to Cleo, Mark Sandman, Buffalo Tom, Amanda Palmer, and Sully Erna, of Godsmack. Jazz and folk make solo appearances, courtesy of Robert James Campbell’s view of Bud Powell at the piano in 1964 and Richie Havens in the mid-’60s. 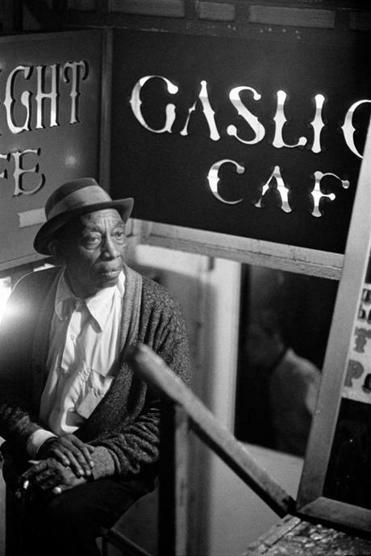 Campbell also has the earliest picture in the show, Chuck Berry from the late ’50s, and the show’s nicest surprise: the sight of Mississippi John Hurt, outside Greenwich Village’s Gaslight Cafe, in 1964. I do not know whether there are angels in heaven. What I do know is that when they sing they sound like Mississippi John Hurt. There are two photographs from 2016: Helena Akhtar’s of Sour Cherry and Stephen Sheffield’s of an earth mover with “METAL” in big white letters inside the bucket. That’s a pretty funny joke, as well as an example of how happily loose the show’s definition of music can be. Another example is Glen Scheffer’s five pictures showing stacked LPs. Like Lennon and Dylan, B.B. King makes more than one appearance. Charlie Sawyer’s view of him standing onstage at a Chicago club is one of the few images in the show that includes the audience. 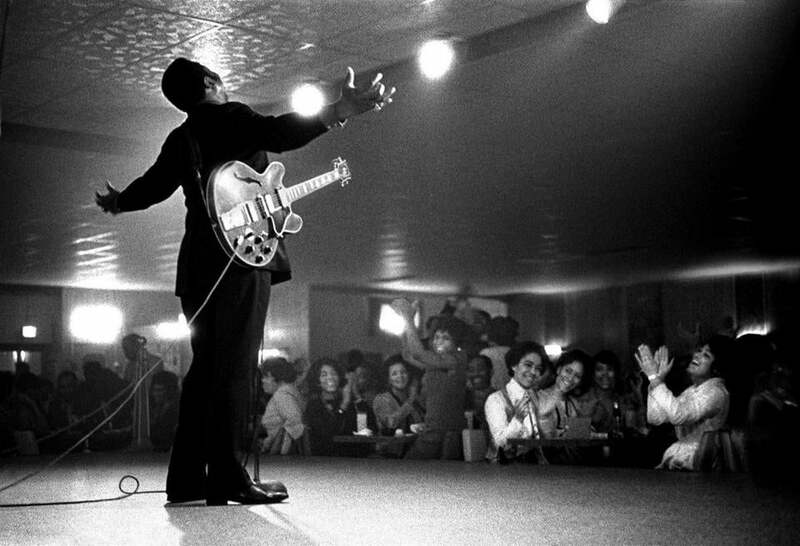 With arms spread wide and at his side Lucille, the most famous guitar in music history, he’s basking in his listeners’ adulation. No wonder B’s basking: Nearly all the adulators are female. In Marc Lacatell’s 2014 photograph, the singer is seated, enthroned in sweet majesty. A different kind of majesty obtains in Sawyer’s picture of Howlin’ Wolf holding a can of Budweiser. “I asked her for water/ She brought me gasoline,” the Wolf famously sang. One man’s refinery is another’s brewery. That’s another form of synesthesia, perhaps, the way a certain taste in the mouth produces a certain light in the eye.